In the final part of our interview with Mr. Ireland of GAIJINWORKS, we discuss the digital rights to the Working Designs catalog, about the localization of both the Lunar series and the Arc The Lad Collection, the definitive history behind the Ghaleon Punching Puppet, and what is possibly in store for the future at GAIJINWORKS. You can find out more about GAIJINWORKS at their website and by following them on Twitter. Also, Summon Night 5, the latest game to be localized by GAIJINWORKS, is out now on the PlayStation Network for digital download! You can find it for purchase for North America on the PlayStation Network here. Interview by Quentin H. A special thank you to Scott MacDonald for help with vetting the questions and coordinating the interview. Also, another special thank you to Chris Bieniek for assisting with my follow up questions, requests for photographs, and other assorted material. This interview took place on November 27, 2015. OR: Back in 2012, you mentioned about wanting to bring all of the Working Designs PlayStation One games out on the PlayStation Network. Some of them, most notably the Lunar series, are still not available. VI: Yeah, we’re still trying to make that happen. It’s a loooooong, loooooong, looooooong, looooooong, roooooaaaad. But we’re still trying to make it happen. Doing whatever we can to get it to actually come out. OR: Does GAIJINWORKS still hold the rights to the digital distribution of the Working Designs games? VI: No, no. We have to license them too. ‘Cause we don’t have – Working Designs, all that stuff was sold off. So we don’t actually have – we have to license it to be able to release it. So, yeah, it’s just a process [of getting] the stuff licensed. You know, we’ve tried to also get Silhouette Mirage out. But that’s a tough one. We can’t [get] any sort of movement to be able to release that one. And then RayStorm, RayCrisis, those can’t come out because Square Enix owns [them] and they aren’t really – they don’t seem to be interested in licensing anything out. So, we can’t get those back on. But basically, the only ones left that are possible, I think, is both of the Lunars and Silhouette Mirage. And we’re working [on] all of them. We’re trying to get all of them to the point where they [can] come out. OR: If you were to start bringing back the Lunar games, would you be able to tweak them, or would you want to at this point? VI: You can’t tweak anything you’re releasing on PSN. You have to release the version that came out on the disc when it was released. So you can’t hack them. ‘Cause we were trying to do a hack for Moon [Moon: Remix RPG Adventure] on the PS One in English that never came out or Policenauts, that would have been cool to hack in the English and release that, but you can’t do any hacking. It has to be the version that was released and approved originally. So there’s no changes allowed. OR: Along these lines, we’ve had a billion-and-one different releases of [Lunar] Silver Star Story since the Sega CD came out. Yet, we’ve only had one –I think- in North America for [Lunar] Eternal Blue. Can you see any particular reason behind that? VI: I think ‘cause the re-releases were not well received enough to do Lunar 2. It’s like ‘Let’s try it…that didn’t work so well…Let’s try it…it didn’t go so well…’, so they keep trying to restart [it], and ‘cause Silver Star Harmony in Japan bombed. It did terrible. It did better in the U.S. than in Japan. The Japanese release had horrendous sales. So I think it’s an issue of they haven’t gotten enough response when they retried the first one to retry the second one. It’s only been high enough ever once, really, when we did the PS One version after the Sega CD version. But we were on an up slope for that. The Lunar Silver Star [Story Complete] was like the number one, number two, release [when] it came out in the U.S. It was nuts, it was crazy. I should have saved that magazine because it was insane to see Lunar like, of all the games that came out, it was like at the top. It was one, or two, I don’t remember which. But, it’s never been that high again in the U.S. or in even Japan, actually. 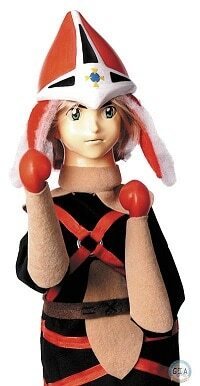 OR: One of my favorite pre-order bonuses ever, and definitely one of the most unique I’ve ever seen was the “Limited Edition Interactive Amusement” Ghaleon punching puppet. VI: Yeah, I loved that. 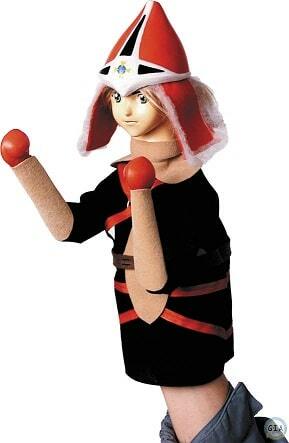 The interviewer’s personal Ghaleon Punching Puppet. OR: What in the world lead to its creation? What [was] the story behind [that]? VI: We had a punching Godzilla – somebody had a punching Godzilla, I think it was Zach or Dave, I’m not sure which – they had a punching Godzilla. And they’d just go around – and it was so much fun to play with that punching Godzilla, do the hands, interact and make it talk. Be crazy with it. And then that just sort of led to ‘let’s make a Ghaleon doll’. And I have a plush Ghaleon that was made that was just not good enough. It was ‘uhhhhh, no, not it.’ And then I hit upon the idea of ‘let’s do that, let’s put Ghaleon’s head on that punching dragon – on the punching Godzilla.’ And it was fantastic, it turned out so cool. 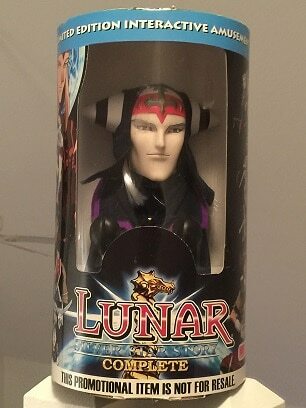 And then once we had Ghaleon – we had the head molded in China originally. It came back just looking like – he looked all fat, his face looked all fat and chubby and just wrong. And [Toshiyuki] Kubooka [Lunar: SSSC and Lunar: EBC’s character designer/animation director] saw it, and he’s like ‘Well, I can put you in touch with a Japanese company that I work with called – I think they are called- Heavy Gauge and they’ll do the head and I will supervise for free.’ I was like ‘I’m not gonna turn that down.’ So that’s why the head turned out so cool looking, because the sculpture that was made [for] that was actually conceived by Kubooka himself. So we got those molds back and we actually got molds made for that, Alex – which was un-produced -, we have Borgan, and we have Lucia. But the Alex heads were molded into actual plastic. I have plastic Alex heads. But I only have the molds for Borgan and Lucia. But yeah, the plan was to do a set of punching puppets so you could have them all fighting each other. But that never happened. OR: You mentioned characters from Lunar 2. Were you going to offer them as a bonus for Lunar 2 as well? VI: For Lunar 2 PC. The PC version, which never came out because it was too buggy. We were developing the puppets in anticipation of releasing the game. It was going to be [that] Lunar 1 would get the Alex puppet [OR Note: Displayed above on left/right], Lunar 2 PC would get the Lunar 2 puppets – I’m not too sure. But [Lunar 2 for PC] was too buggy, so the game couldn’t be released because they couldn’t get the bugs out. It was basically an emulator of an emulator of an emulator and it was so buggy that that they couldn’t fix it – they couldn’t create a version that actually worked and so it never came out. But there’s like six, seven Alex prototypes that are actually dressed with the costume and [in] various ways. And then the Borgan and Lucia [puppets] are just the heads. ” Yeah, I do all the songs. All the English versions. OR: Is there any chance of this occurring again with GAIJINWORKS? VI: I’m not going to say ‘no’, I think it would be cool to do, but the thing is that with the way that the rights are with Lunar, we sold most of the rights back to Game Arts. So Game Arts has almost all the rights to Lunar, except for the performance rights to the audio. So really they have most and if the Lunar license was to happen, we would just be licensing that little piece so it could come out. And it would probably come out under their name. So they would do the marketing for it. So I think it’s unlikely. But I’m not going to say ‘no’, it would be cool to do. And I would be fine with another version of Lunar, another console version. Just don’t do crazy stuff like Harmony’s beginning, ugh, that beginning was so bad. It just ruined the characters. I mean, this is not Mel. They don’t sound like this, they don’t talk like this, they don’t look like this, they don’t act like this. It was just wrong. A classic version, something halfway between maybe ‘Mr. Sega CD’ and ‘Mr. PlayStation’ telling the story would be cool. OR: You said that Harmony’s localization was a disaster. Do you think that played a role in how the game was received? VI: For sure, yeah. I think that if they had not messed around with the text and used the original voice acting, it would have been better than what they had ended up with. Because those songs are painful to listen to. That’s a perfect example of translation versus localization. Those songs [were] translated and they [were] really hard on the ears.